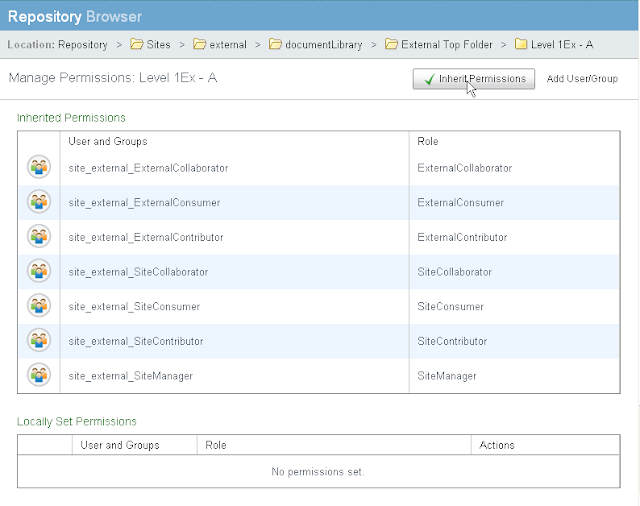 In the previous blog we saw how we were able to fairly easily replace the Share Manage Permissions dialog with the Manage Permissions page used for the Repository button browser. This allowed us to be able to assign at a much more granular level permissions to the folders and items that are stored within a Share site Document Library. Now consider the scenario where we would like to be able to invite users to our site, and these users should be able to see and modify only a selected set of documents within the Document Library. We want access to the site for the majority of users to be unrestricted. This scenario doesn't work well with the standard Share site roles of Manager, Collaborator, Contributor and Consumer. To invite a restricted user to the site, we still need to give them a role. Even if we give this user the role of Site Consumer, they will be able to see much more content in the site than what we want them to see. What I propose here to help solve this problem is to add new custom Share site roles. 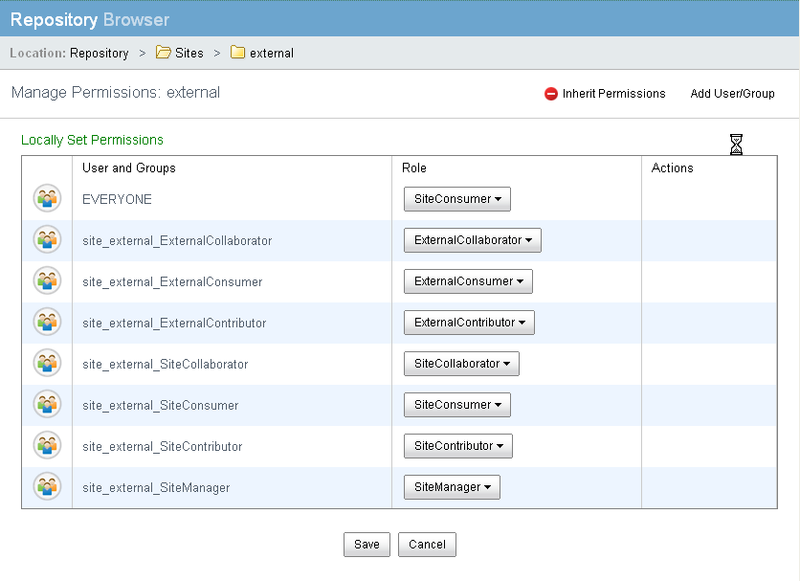 Alfresco has a wiki page here that provides a good start for what needs to be done in creating a custom Share role. After following the instructions there, which were targeted for version 3.2r, I ran into some issues, and I noted a number of other people in the Alfresco forums also had some issues with it. What I describe here should work with a fresh Alfresco install. 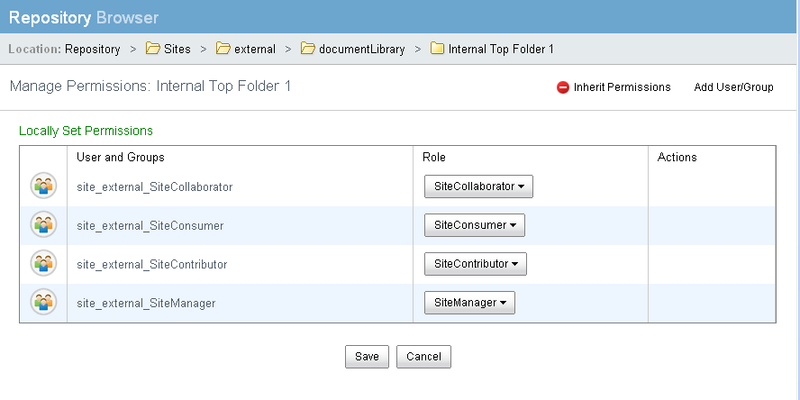 Trying to add new roles after Share sites have already been created will likely result in errors being thrown. The reason why this happens is that the appropriate group authorities will not exist and Share will report that as an error. Once these new roles are created, Share expects them to exist for all sites. The absence of these authorities for existing sites likely is something that can be corrected by manually creating the correct authority objects in Alfresco, but we don't attempt to do that here. 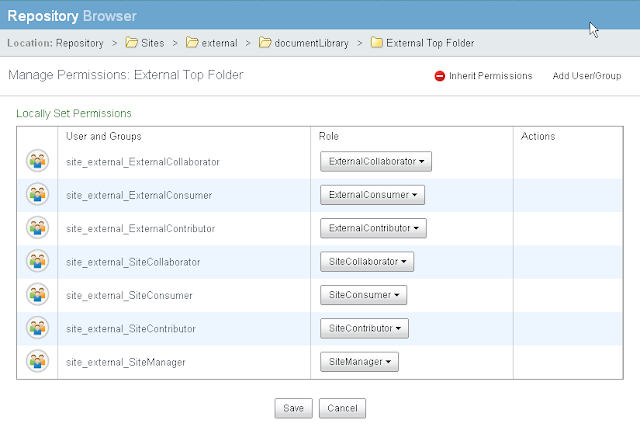 Here we will create three new permissions sets/roles called External Consumer, External Contributor, and External Collaborator. 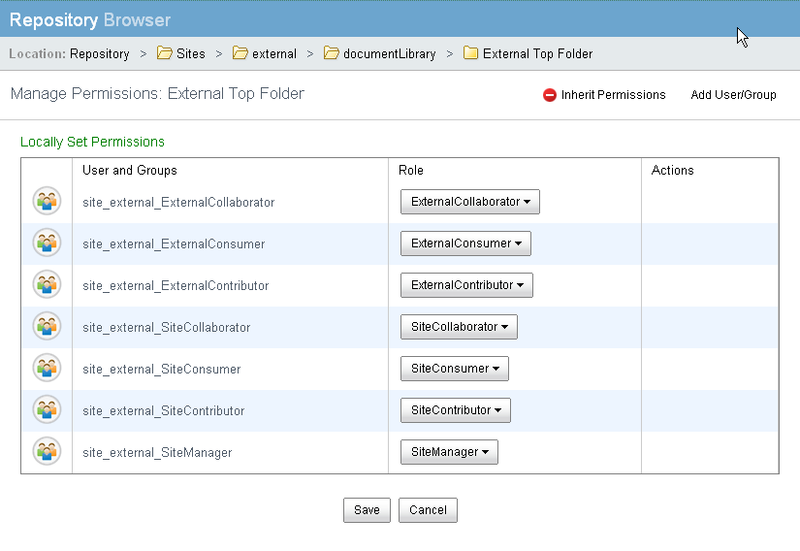 The permissions for each of these roles are identical to those of the corresponding Site Consumer, Site Contributor and Site Collaborator that come standard with Share. 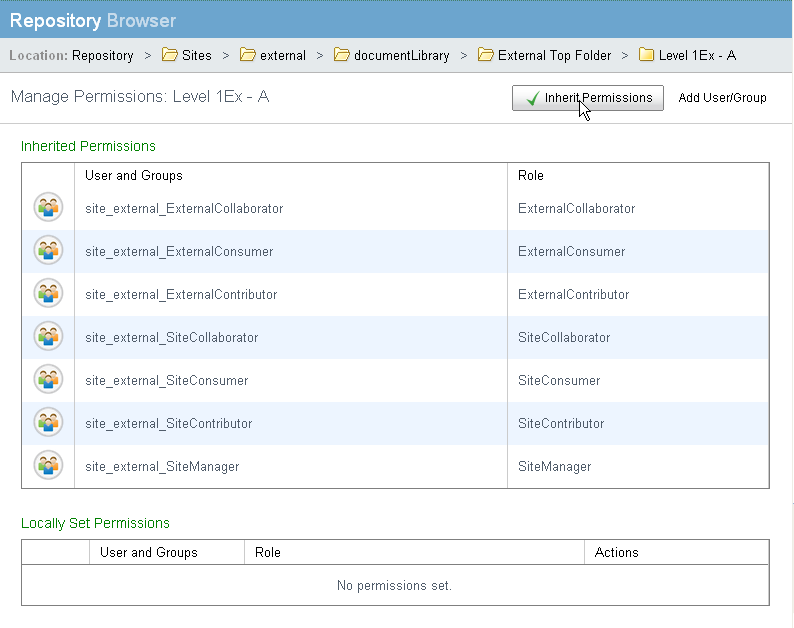 What will be different is how these permissions are applied to content in the Document Library. Finally, there are a number of files where we add string properties that can be picked up so that the new role names display correctly within the Share UI. 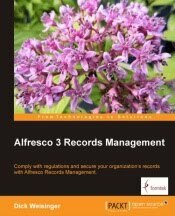 After doing that, we stop and restart the Alfresco server. We can then log in and create a new Share site. Immediately after creating the site, we can navigate to the root node for the site by using the Repository button in Share. 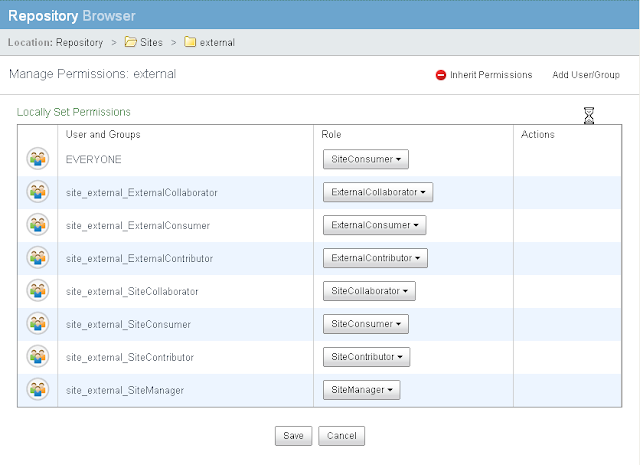 When we click on the Manage Permissions button for the new site, we can see that our new permissions sets (ExternalConsumer, ExternalCollaborator, and External Consumer) are included automatically and applied to this node. 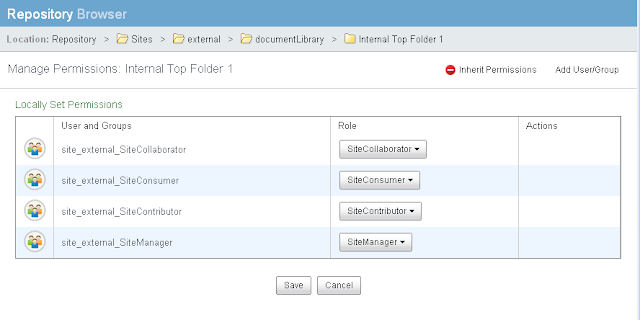 At the Document Library level, we can create a folder structure where two top level folders are to be accessible only by the standard SiteConsumer, SiteCollaborator and SiteContributor. 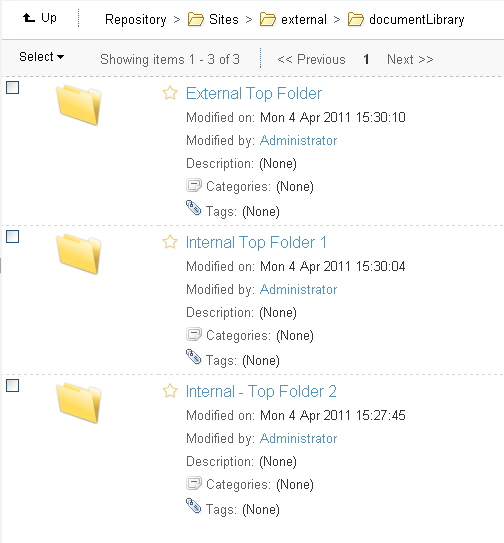 And a third folder is available to standard users and is also open for viewing to External Reviewers. With these settings, only internal reviewers will be able to see the content of this folder. In this case, we can see that both external and standard internal reviewers are able to access this folder. "Trying to add new roles after Share sites have already been created will likely result in errors being thrown" ID (ALF-8149). I lost a good part of a day before I understood the problem. This explained it to me in minutes. Great and very helpful post, thanks !!! !